Are MicroRNAs the new players in metabolism and metabolic disorders? – Bio-Synthesis, Inc.
Home › Antagomirs › Are MicroRNAs the new players in metabolism and metabolic disorders? Micro RNAs (miRNAs) have recently emerged as key regulators of metabolic processes! More and more evidence is accumulating that suggest that the dysregulation of miRNAs may contribute to metabolic abnormalities such as the misregulation of cholesterol and lipid metabolism, insulin and glucose homeostasis as well as others that may still need to be to discovered. The proper control of metabolic processes to maintain homeostasis is crucial to the maintenance of animal and human physiology and health. Homeostasis (homoeostasis or homœostasis) refers to the property of a system that is able to regulate its internal environment. The animal as well as the human body regulates a multitude of highly complex interactions to maintain balance or return metabolic systems to functioning within its normal range. Whoever has attempted to loose weight fast by adhering to a special diet will have observed that the human body tends to go back to its original conditions as soon as the diet is no longer adhered to. Research results accumulated over several decades suggest that the majority of cellular and physiological responses to altered dietary and metabolic conditions occur at the level of gene regulation in the cell nucleus. It has been observed that a number of transcription factors that play key roles in an organism respond directly or indirectly to nutrients and metabolic cues such as the change in cholesterol, lipids, glucose and insulin levels. When these transcription factors encounter these cues they rapidly alter gene expression programs that are involved in the regulation of metabolic pathways to maintain homeostasis. The list of transcription factors include peroxisome proliferator-activated receptors, liver X receptors, sterol-regulatory element-binding proteins, carbohydrate response element-binding proteins, CCAAT-enhancer-binding protein and forkhead box protein O1, to name a few. As more and more scientist study metabolic events the number of these transcription factor will surly go up. The canonical biogenesis pathway generates miRNAs by transcribing RNAs as precursor RNAs from intergenic, intronic or polycystronic genomic loci with the help of polymerase II (Pol II). The primary miRNA (pri-miRNA) transcript forms a stem-loop structure. This structure is recognized and processed by the Drosha and DGCR8 RNase III complex of the spliceosome apparatus in the nucleus. The non-canonical miRNA pathway transcribes miRNAs directly as endogenous short hairpin RNAs (endo-shRNAs) or through splicing from introns that can refold into hairpins (mirtrons). The trimmed precursor (pre-miRNA) hairpins from both pathways are then transported by an exportin 5 and RAN-GTP-dependent process to the cytosol. Typically, in the cytosol these RNAs are further processed by the Dicer and transactivation-response RNA-binding protein (TRBP) RNase III enzyme complex forming the mature double-stranded ~22-nucleotide miRNA. Next, Argonaute proteins unwind the miRNA duplex and facilitate incorporation of the miRNA-targeting strand into the AGO-containing RNA-induced silencing complex (RISC). This strand is also known as the guide strand. The RISC-miRNA assembly is then guided to a specific target sequences in mRNAs. The Watson-Crick base-pairing of nucleotides 2 to 8 in the mature miRNA, also called the seed sequence, drives the initial recognition of mRNAs by the RISC-miRNA complec. 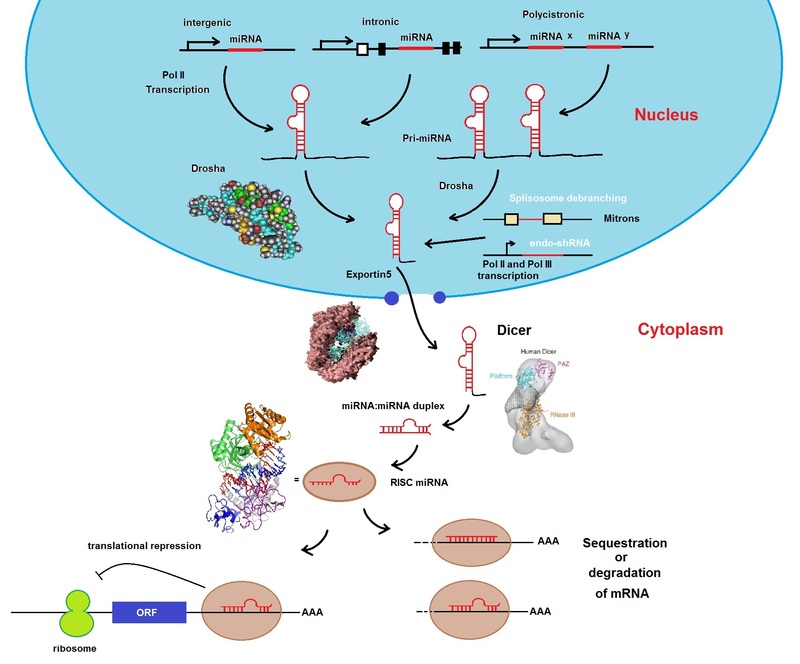 Specific mRNA sequences are mainly located in the 3′ untranslated region and additional base-pairing affords greater affinity and targeting efficiency. Veerle Rottiers & Anders M. Näär; MicroRNAs in metabolism and metabolic disorders. Nature Reviews Molecular Cell Biology 13, 239-250 (April 2012) | doi:10.1038/nrm3313. ‹ What are Nano-flares? What are the features of nano-flares?